Although Texoma Living! is no longer being published, you can search every story, on every page, of every issue. The last issue published was October 2010. The economic downturn caught up with us. It took two years of work to move all of Texoma Living! Magazine’s nineteen issues to this final online resting place. There are over 2,000 pages available. To search for a particular story or subject just click on the magnifying glass icon in the menu bar above, just to the right of the STAFF menu item. A search window will open. Put in a name, a place, a subject, and read to your heart’s delight. As I update this addendum in Spring 2018, it is with great pride that I share the pages of Texoma Living!. As of this update, there have been 3,123,150 visits to our pages. That’s impressive for a local magazine in a small community. I also want to pay tribute to Edward Southerland. Edward’s words made up the best stories we published. It was his article on Lee Hudgins in issue #1 that convinced me it was worth the investment to continue to publish. I never intended to put the Hudgins story on the cover. When photographer Anne Marie Shumate showed us the prints from her session with Mr. Hudgins there was no question that it would be the first cover. Many people don’t know the origin story of Texoma Living!. It was supposed to be a once-a-year magazine for the Sherman Chamber of Commerce —you may notice the name on the first cover as “Sherman Living!”. It took four months to produce that issue. When the finished magazine arrived from the printer, we realized this is something special. Publishing Texoma Living! fulfilled a dream for both Edward and me. Anne Marine Shumate was our first contributing photographer. But Texoma Living!’s pages came alive thanks to the creativity of a short list of artists whose photos matched anything seen on the pages of the biggest and best magazines. Stephen Olner‘s magnificent architectural photos of unique homes and his intimate images for some of my favorite features are still on my personal favorites list. Jacki Lee (Miller) Sanoja became a go-to photographer for capturing just about anything. I was first attracted to her out-of-the-box style and composition. 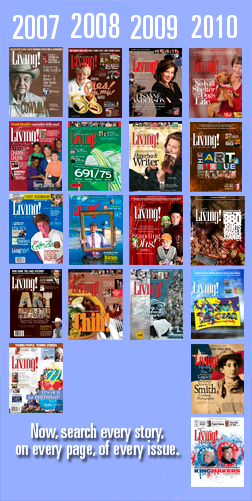 There were many contributors to Texoma Living! and you will see their names attached to stories in this archive. You can browse the staff list here. All were important, and part of what made this magazine special. If Jesse Gunn Stephens were still alive, she would have first cringed, then corrected that headline. Jesse passed away March 10, 2014. Jesse was Senior Editor at Texoma Living!, but we thought of her as the “Grammar Boss.” It was her attention to detail and understanding of colloquialisms and what a predicate nominative was that put her above the rest of the staff. She was also a published author, a Master Gardener, and fount of knowledge on many subjects. She kept us grammatically in line and out of trouble with English teachers everywhere. Words and pictures. The legacy of a grand experiment in big city publishing for a small community in North Texas. Rarely a day goes by that I do not have the opportunity to reminisce about my time as publisher. I am convinced that in the end, my obit will lead with “former publisher of Texoma Living! Magazine.” I’m OK with that.